As usual, I have way too many projects in process at once . . . so those with a definitive deadline are the ones that get finished first. Over the weekend, I started cutting out the pieces of fabric and batting for the next two Chelsea backpacks that I am making for my SIL, Sandy, and my niece, Jenna. 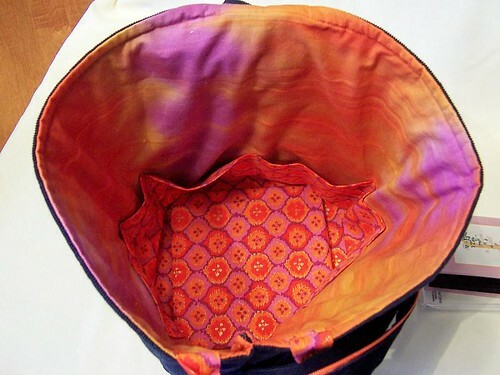 The Chelsea backpack is a pattern created by Lazy Girl Designs, and I previously have made two of them for my nieces Nikole and Elora. I still plan to do one for myself, but I can't decide what fabric to use . . . should it have a westie on it? or maybe I should use my precious out-of-print Mets logo fabric? or something else . . . so instead of making one for me, I'm working on theirs. I'll probably end up with several of my own, someday. Jenna had written me that her new favorite color is orange and reminded me that her birthday is coming in March, so that gave me both a theme and a deadline. I like directions and deadlines to keep me on track. 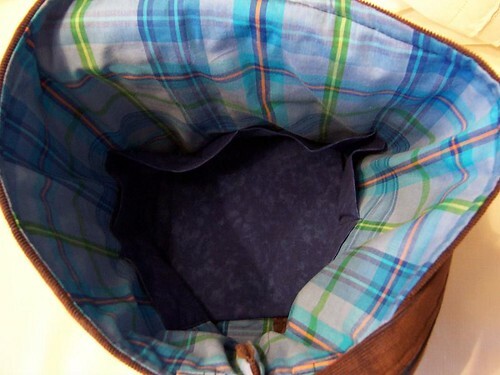 Anyway, once the pieces are cut, the outer layer is quilted. I finished that for both backpacks on Friday. It's easier to do two at a time, so I don't have to keep changing my machine set-up from regular sewing, to using my dual feed foot, to embroidery and back and forth . . . and I'm using the same thread color to sew some parts of each, so that saves time as well. 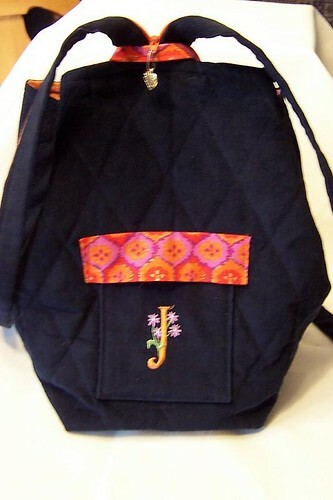 On Sunday, I embroidered the outer pocket for each, then began assembling the backpacks. 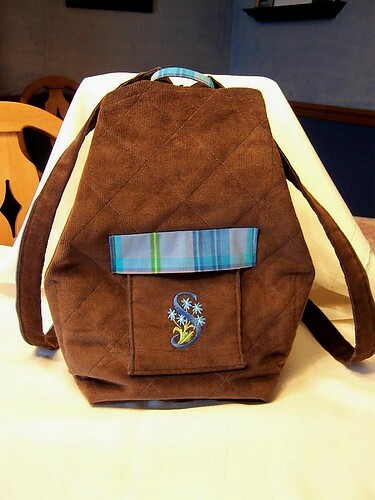 I finished Sandy's and I think it looks good, but I need to find a "cool" zipper pull. Jenna's still needs a few more steps to be completed, then I'll be done, with time to spare before her birthday. Next, I'll be starting on the 30 wedding favor bags I am doing for an ebay customer. I have all the fabrics, threads and ribbon ready to go. I'm going to do them in batches of 5-6 at a time, so I can be sure to keep the quality consistent. These bags are made entirely in the embroidery hoop; afterwards, I've been finishing the raw edges with my new serger to keep them from unraveling. I am doing half of them out of sheer white organza and half out of white crepe-backed satin, with the stitching on the satin side. I'll post about my progress next week. This is another project with a deadline . . . I have until mid-April, but would like to finish them sooner. I don't know yet if I'll have time for any St. Patrick's day embroidery.